Festivals can be wonderful gatherings for communities, friends, and families. Local businesses get to thrive and people get to have fun. Festivals are often centered around a certain subject, like movies or time periods. Sometimes they’re centered around more obscure subjects. Here are six weird and wild festivals from around the world that you may not have heard of yet. Pencil them in on your bucket list! Are you a skeptic? Are you a believer? Whatever it is, come on down to Marion, North Carolina, for a fun time at the Bigfoot Festival. After multiple Bigfoot sightings in the city, organizers decided to put together an event themed after the legend. Thousands attended as vendors sold Bigfoot-themed items in the small North Carolina town. It’s a fun time for sure. Whether the creature is real, however, is up to you to decide. Maybe a trip to the festival will convince you. In 1947, a weather balloon crashed near Roswell, New Mexico. Or was it just a weather balloon? 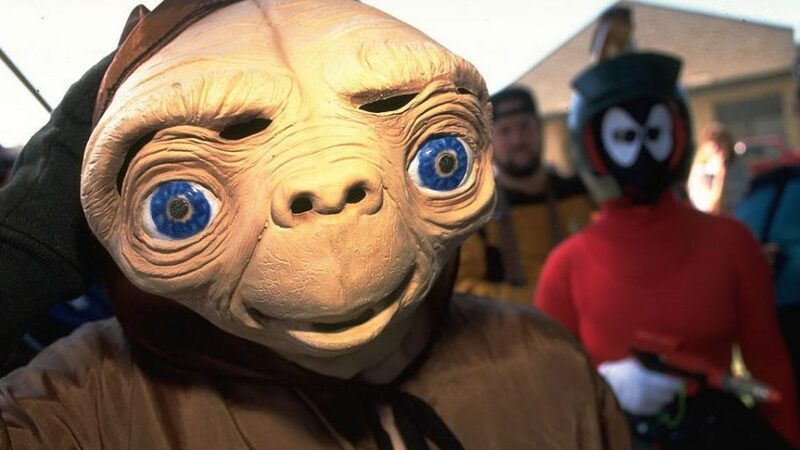 Conspiracy theorists have claimed it might have been an unidentified flying object, so people decided to create a festival in the small southeastern town. The Roswell UFO Festival has grown exponentially; last year, 38,000 people attended. Other towns, such as McMenamins or Pine Bush, have followed and created alien-themed festivals as well. As with the Bigfoot festival, both believers and skeptics are welcome to attend. Did you ever want to attend an event that was really nuts? One where you could find giant squirrels? Or see the world through the eyes of a squirrel? Well, come on over to Longview, Washington to the Squirrel Fest! It’s a fun event for children and people who aren’t afraid of giant squirrel statues. No, the Underwater Music Festival is not located in Bikini Bottom. 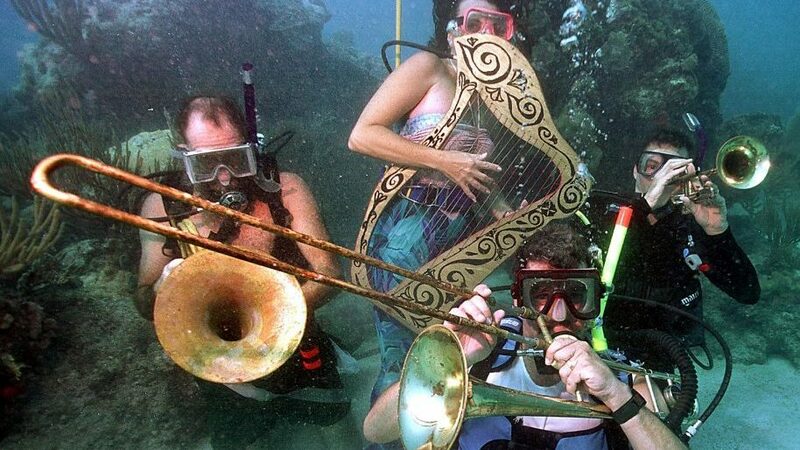 It’s in Florida, where you can dive to the depths of Looe Key to listen to some deep music. Now, the festival doesn’t just exist for fun. The goal is to raise awareness of reef protection. While the music is also available over the radio, the festival brings an opportunity for divers to explore the tropical region, listen to some great music, and support a cause. Did you know that in 1945 a chicken named Mike survived without its head for 18 straight months? Well, now you do. The town of Fruita, Colorado, is where all the headless fun happens. Mike the Headless Chicken Festival is an annual event in the deceased chicken’s hometown featuring great music, fun games, and delicious chicken. While you’re there, you can check out a statue of Mike as well. Food fights can be nasty and violent, but when you have hordes of people participating in them voluntarily, they’re not so bad. 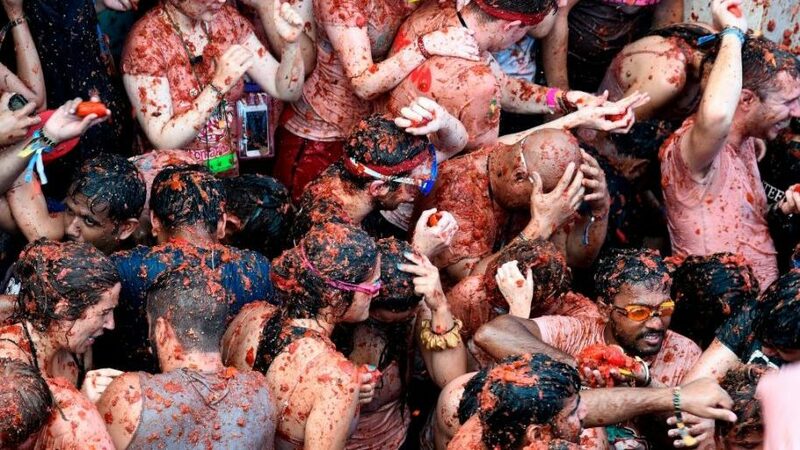 Every year, several tens of thousands of human beings gather in the Valencian town of Buñol to throw tomatoes at each other. 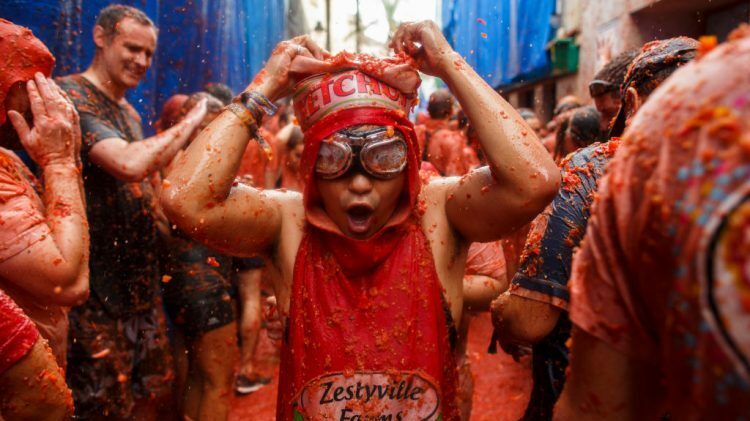 La Tomatina is the name of this occasion and is considered the “world’s biggest food fight.” Don’t worry about food waste, as the tomatoes chosen for warfare are overripe.